Set in the summer of 1959 we follow the story of a 16 year old 'Christmas casual' in the frock dept. at Goodes [the façade of Mark Foy's flashes on the screen] one of the many prestigious department stores in Sydney at that time. Stockings, not pantyhose, women's bodies were encased in corsets and customers were called 'Madam'. There were front doormen and gentle music wafting through the ground floor from a grand piano. The store was dedicated to every item Madam could need including a fur department. For those lucky enough to live through this wonderful time when 'we lived in a cocoon and didn't know how lucky we were', it was a time of learning and sharing. Immigrants were still referred to as 'Reffos', but the fear that existed between the locals and new arrivals was gradually disappearing and new ideas were flowing between the two groups. The locals finally accepted the stranger's new ways, in particular, their food, as the newcomers wanted to put their stamp on their new home peacefully. The lives of three of Lisa's [name changed from Lesley] workmates are the backbone of the story. The woman in the model gown dept. becomes her mentor when she spots her potential. Lisa, a suburban bookworm, is intellectually a cut above her workmates and longs to go to Sydney University to study, what else, arts, however, she still longs for a proper grown model gown. 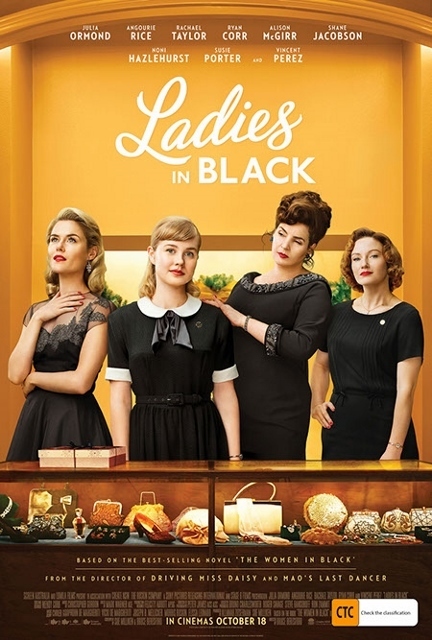 Ladies in Black gently treats serious challenges of the time, the assimilation of the newcomers from Europe and the part they played in changing a bland society into one which absorbs new cultural ways. The period is lovingly recreated, trams down Elizabeth Street, Repin's coffee cafes, [no famous Cahills restaurants? ], no high rise and the authentic frocks that were worn. How do women gently persuade their husbands to change with the modern times? Simple. Firstly, the daughter convinces the mother that what she wants needs to be accepted by the father. Then mother and daughter conspire to get the father to agree at the right time, e.g. when he has had a win at the races before he goes to the pub. Falling in love with the characters is easy due to the skill of the producer, Bruce Beresford. The script was written by Bruce Beresford and Sue Milliken. It was adopted from the novel written by Madeleine St. John who published the book in 1993. The cast is made up of well-known Australian actors including Angourie Rice, Shane Jacobson and Rachael Taylor. I didn't want the film to finish and need to see it a second time. The film is showing at the Avoca Cinema. This cinema is like no other. Current releases, live shows, operas from the Met Opera house in New York are included in the weekly program Beth arranges. Jane Rutter, known as 'Madam Flute', mustn't be missed on 7th October.